The GPRS system is a technology used in contaminated soil areas to conduct routine large area gamma radiation surveys. 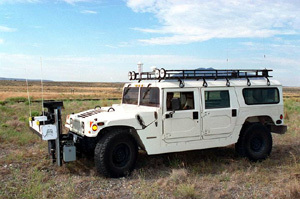 It uses a detection system, a portable computer, d-gps, and a four-wheel drive vehicle. The detection system consists of two 4 in. x 26 in. x 1.5 in. plastic scintillators housed in an 8 in. x 72 in. white enamel steel box. Each scintillator uses an independent amplifier channel on a single channel analyzer board and shares a common high voltage power source.The GPRS system is operated at a speed of approximately 5 mph to collect the most accurate gamma radiometric data. The detectors are mounted on the front of the four-wheel drive vehicle at a height of 3 ft. The detector system weighs approximately 250 pounds.During operation the detector interfaces with the computer and displays information like radiometric data, geographical data, altitude, time and data. The system records this data along with the associated geographical coordinates in memory on the onboard computer. This information is updated approximately every two seconds with the new data. -A need for future development would be to retrofit this technology with a real-time capability for identifying the gamma-emitting radionuclides. It should be used with a suite of additional tools (i.e., In-Situ Gamma Spectroscopy) to quantify and identify the gamma constituents of this survey area. The Global Positioning Radiometric Scanner System used at the INEEL.